If you've ever noshed on the sumptuous bao of Hong Kong Bakery or slurped down pho from Pho To Chau, you have walked past Odd Fellows Lodge #244 Maybe you and your kids have seen inside this historic 1909 building during the Odd Fellows' annual Spring Mad Hatters Tea Party, Treasure Hunt, or Haunted House. Maybe you visit the lodge every Wednesday night for the Odd Writers' League, one on 2nd and 4th Sundays as a genderqueer member of the Oddizens DnD group. Maybe you're a foster child whose Court Appointed Special Advocate (CASA) is using the Odd Fellows' kitchen to teach you how to cook. Maybe the Odd Fellows gave you a book scholarship for college or your grandfather was an Odd Fellow. Maybe you come to their monthly Muslim immigrant women's dinner group to cook, dance, and sing in a private and welcoming space. But if you're not one of the dozens of residents who fill the space with life every week, you might not have any idea what an Odd Fellows Lodge is or why there is one in downtown Mountain View. Let's start from the outside-in. The building is at 823 Villa, on the corner of Castro and Villa, housed in the old First National bank (built in 1909). The Odd Fellows have owned the building since 1970, when they bought it from a Christian Science reading room. Some members suspect there is beautiful earth 20th century crown-moulding hidden behind the '70s-tastic drywall ceiling with its embedded florescent lights. They're deciding if they want to find out or keep it a mystery for the next generation. It's not a beautiful space when it's empty, but if you've seen it teeming with children during the Haunted House or filled with laughter during the weekly writing group, you know that looks aren't everything. Now, who are the Odd Fellows? And what's with the name? The Odd Fellows are a fraternal order, like the Eagles whose Aerie is across Castro street. Think of it like a union or a social club. There are bi-monthly business meetings that use Roberts Rules of Order; there are century-old rituals, regular dinner parties, and lifelong friends. 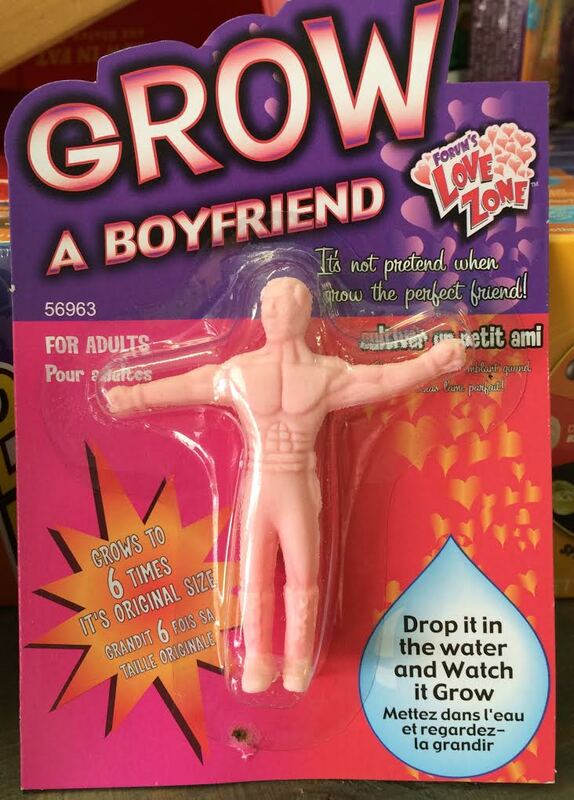 Applications are open to anyone of any gender. The current head of the lodge -- called the Noble Grand -- is a 30-year-old East Palo Alto and San José native and queer woman, Jessica Dickinson Goodman. One of the other members, whose average age is in the 60s, let her know she is the youngest woman ever elected to be the Noble Grand of a Silicon Valley Odd Fellows lodge. The woman serving as Vice Grand this year, Jackie Brown, has played a major role in keeping the Odd Fellows Lodge alive in Mountain View for the past 30 years. These kind of intergenerational groups are a vital part of a healthy community where we may not always agree, but we can find ways to work together. There are dozens of Odd Fellows lodges in the Bay Area -- Saratoga, Cupertino, Redwood City, San José, San Francisco all have a lodge or six. But the Mountain View Odd Fellows is unique in how they share their space, for free, with anyone who is furthering their mission. Much of their mission uses archaic language that speaks to their 170-year history. But it boils down to: members of Mountain View Odd Fellows are working for a world with more truth, more friendship, and more love. To them, that looks like providing their space for free to groups supporting people in our community who are not always welcomed. To them, that looks like donating nearly $10,000 a year to groups like the Community Services Agency or RAICES. If you've like to use their space, you can fill out this application; expect to wait a few weeks for a confirmation of the schedule. If you'd like to join the lodge, come by during any one of the public events, or reach out to their Noble Grand -- Jessica Dickinson Goodman, Jessica.dickinson.goodman@gmail.com, 650-804-9044. If you're interested in joining a different lodge in the area, she is happy to help connect you to her fellow Nobles Grand. What does it take to be a member? All members have to believe in a higher power, broadly defined. They have to pass an interview with 3 current members. Once the lodge votes to approve them, the lodge welcomes new members through an initiation ceremony every 5th Monday (about once a quarter). The next initiation is April 29th. Annual dues are $45, and have gone down since 1923, when they were $50/year. Once you're a member, you can apply for $1000 a year in scholarships, can use the space for the own events with the consent of the lodge, among a range of other benefits. The lodge has a comfortable budget from years of wise/lucky investing and is glad to be in a position to support its members without having to fundraise. But you don't have to be a member to use the space. So if you've dreamed of teaching a dance class or running a pop-up gallery*, if you have a book club that's overflowing your living room or a birthday party and you don't mind '70s-tastic decor, reach out. Thursday July 11th (Thursday Night Live), the Odd Fellows will be transformed into a pop-up ceramics gallery hosting local artists from 5-9pm. RSVP here or just come by during Thursday Night Live. Generally, the Odd Fellows host groups who don't have a budget (genderqueer board gaming groups and writing clubs are probably never going to be 501(c)3s). But if your group is charging for an event or class and fits their mission, the Lodge asks that at least 10% of proceeds be donated to a community group. You can indicate which one in your application. So the next time you're getting bao or pho, the next time you're sipping coffee at Red Rock or enjoying a taco at Agave and wonder about that building with the blinds drawn, now you know it might be full of writers drafting their next poems or a foster child learning to bake her first cake -- or maybe it's empty, just waiting to host your next big idea to benefit your community. I stopped by East West Bookshop last week to check out one of the largest crystal selections in all of northern California. If you haven’t seen the new display case full of museum quality gemstones, you need to stop by. It’s full of some of the largest crystals you will likely ever see. These massive stones would be gorgeous as focal art pieces in Silicon Valley offices or your home. The store manager, David G, has been at the store for the last year and business is better than ever. David has been part of Ananda (that’s the spiritual community that manages the store) for over 35 years. When I think about downtown Mountain View businesses, and what the vibe of our city is, I think of East West Bookshop. I’ve been a customer for decades, and I’ll never forget the day I was shopping there and I looked up to see that the customer next to me was Dr. Andrew Weil. I was a little star-struck, and in excellent company. The store is a destination for anyone seeking spiritual education or resources, or just beauty and fun. As soon as you walk in the door, you can feel that it’s different. It’s calming and welcoming. David told me that he’s proud that his staff has a broad variety of skills, everything from tarot reading to Eastern spirituality, to crystals and their healing properties. And the customers that are attracted to a store like this are also focused on a kinder, gentler, more inclusive community. It’s quite magical. Whatever you’re into or interested in, East West has you covered, everything from yoga and meditation supplies, candles, books, music, clothing, jewelry, incense, crystals and even more candles. I met Alex, the gift buyer and asked him to point out something that was particularly popular over the holiday season. And now I know that the Boom Bowl Sound Amplifier is Mountain View’s most wanted item. The event space in the back of the store is where much the evening action takes place. Definitely grab one of the event catalogs at the front desk, or go online to see everything. East West Bookshop does an outstanding job at hosting some of the most fascinating events in the Bay Area, most of which are free. Come as you are and stay as long as you want. That’s the feeling I get when I’m there. Leave your troubles at the door, go sit by the fountain and relax for a few minutes, or even a few hours. Really, what other business sends out this message to their customers, to stay as long as they want? No one. I absolutely love this peaceful little refuge in the heart of our chaotic city. Is it really a “challenge”? I’m talking about the ‘7 Black & White Photos in 7 Days’ that is going viral right now on Facebook. People aren’t being asked to dump a bucket of ice water on their heads, or to freeze like a mannequin, or to do 22 pushups, so why are we calling it a “challenge”? I don’t really care that it’s too easy to be challenging; I’m much more concerned with the fact that there’s no real cause associated with it. It’s fun for creative people, which includes me, so I thought I would join in, but do it from a business perspective. Let’s support it and cheer on the small businesses in our community. And now it has a cause connected to it! It's that easy. Global Beads owner, Kathleen McCabe, tagged me and my personal Facebook account, so I responded from my ILoveMountain View page and tagged businesses around town. I’ve never seen a business participating in this silly Facebook activity and I thought it would interesting to see what businesses would tag each other. I hope I’m not stressing them out by putting more on their plate. I must admit, I have a slight advantage since I work at the Chamber of Commerce, and I probably know hundreds of business owners around town. The photos posted here are the ones I took specifically for the challenge, and I encouraged the businesses that I tagged to highlight something interesting about themselves. Let’s do our best to help small businesses in Mountain View, in any way we can. Did you know that if someone spends $100 at a local business, $68 stays in the community, as opposed to spending $100 at a nonlocal business. In that case, only $43 stays in the community, according to American Express. Even if you aren’t able to shop on the exact date, November 25th, the “holiday” if that’s what you want to call it, brings a great deal of awareness to local small businesses. Whether you’re supporting local businesses with likes and comments on Facebook, which is helpful, or you’re spending your cold, hard cash at their store, which is even better, they could use all the help they can get. #shoplocal #shopsmall I love Mountain View. On Monday, May 15, San Jose will host the Stage 2 Finish of the 2017 Amgen Tour of California. Would you like to go on a group ride that leaves Mountain View and ends at the finish line, just in time to see the pros crossing the line? You’ll be watching Sagan defend last years victory, right here in Silicon Valley. A Cognition Cyclery group ride will be riding from their Mountain View shop to the Stage 2 finish. A guided road ride at a medium pace through Stevens Creek County Park, Los Gatos, Almaden Lake and finishing at Motorcycle County Park in South San Jose. The group will make a couple of stops to regroup and refuel. Total mileage will be about 35 miles. The last mile may be challenging for some people, as it is uphill. I heard a rumor that there will be a van to pick up those that need help in the final stretch. At the Metcalf Road finish line, everyone will relax, recover and watch the pros finish the stage. It’s an experience not to be missed! As an extra special bonus, the first fourteen riders who sign up for the event will get a complimentary shuttle back to the shop with their bicycle, courtesy of Specialized Bicycle Components. RSVP to the event on Cognition Cyclery’s Facebook page to join the fun. The event starts at 11:00am on May 15th. If you’re unable to join Cognition for this event, stay connected to their Facebook page because they have group road rides on Saturday mornings. The regular Saturday group rides leave at 9:00am from both stores (Mountain View and San Mateo) every weekend. The group rides start and end at both Cognition Cyclery locations. Meet at either 903 Castro Street in Mountain View or 66 East 4th Avenue in San Mateo (the two rides will meet at 9am at both locations). Cognition staff will lead these no drop rides and provide a safe and fun cycling experience for everyone. The rides will be less than 30 miles and will target less than a few hundred feet of climbing. This ride is for fun, fitness and to further connect riders in our area. The entire family is welcome, as long as they can pedal 30 miles. What a great way to get to know the area and to connect with other bicyclists in your community. I did the 23andMe DNA test. The results came back in about 3 weeks, much quicker than I expected. You spit in a little plastic container, register your test kit so they know who the spit belongs to, and send it to them in their prepaid package. So easy. All of the results they give you are online. They’ll send you an email and a link to see your results. The results are absolutely fascinating, even for me, at 99.7% European. You get 3 different kinds of information back from them: health information, where your ancestors came from, and some traits about yourself. The European portion of my DNA breaks down into an interesting mix of British, Irish, French, German, Scandinavian and a little Iberian. The health information that 23andMe gives you is whether or not you are a carrier of 39 different variants that may not affect your health, but could affect the health of your family. This could be incredibly helpful if you were planning on having children. 23andMe researchers say that most people have a small percentage of Neanderthal DNA in them and my results showed that I have 253 variants of the 2872 Neanderthal variants that they test for, which means I have less than 80% of their customers. They told me that I have a specific variation that has “less back hair” than other Neanderthals. I consider myself lucky. My results also tell me that I’m likely to consume more caffeine that the average person, I’m a light sleeper, I am probably tolerant of lactose, I have freckles, straight hair, a longer ring fingers than index fingers and some details about my earwax. It's all true and now that my DNA has confirmed my love for coffee, I think I'm drinking even more of it. You can connect to your family members on 23andMe website and view their test results. The 23andMe website is outstanding and has an unbelievable amount of information on it. I've already spent hours on it and they keep sending me more information now that I've agreed to be part of their genetic research. The more questions you answer about yourself, the more points you can accumulate towards more "insights' or information about yourself. 23andMe is in downtown Mountain View and they love it here. They’re very close to the train station and encourage their employees to take the train or bike to work. They have indoor bike parking. They recently joined the Chamber of Commerce and one of their executives will go through the next Leadership Mountain View class, which starts in September. When I tell people that I’m from Mountain View, I always say it with a great deal of pride. And one of the reasons that I have such pride in my community is because it’s the center of technological excellence. 23andMe is a good example of why I’m honored to say I’m from Mountain View. You can sometimes find the 23andMe test kits at Target and CVS, but you can always find them here. Opal Nightclub: Jalisco Heat. It’s Don Julio Silver, muddled cucumbers and jalapeños, fresh lime, and simple syrup. Tied House: Tied House brand Alpine Gold. It won a bronze medal at Great American Beer Festival last year. That’s the Olympics-of-Beer and there are thousands of entries. Eureka: Holy Smokes. It’s Buffalo Trace Bourbon, Maple Syrup, Cherry Liqueur, and Chocolate bitters with real smoke added before the lid goes on. I can vouch for this one. Agave Mexican Bistro: Guava Jalapeno Mojito. Red Rock Coffee: Honey Lavender Latte. Obviously, the regular coffee and espresso drinks are fabulous, but that Honey Lavender Latte is new and you should try it. Stephens Green: The best Guinness anywhere. “Poured the proper way, in the proper glass, at an Irish owned and operated pub.” That’s what he told me and I felt embarrassed for even asking the question. Xanh: Lychee Kiss Martini. House infused sake vodka, lychee liqueur and fresh lychee. Bierhaus: Stiege Pils from Salzburg, Austria. After a lot of discussion and several important people weighing in on the conversation, that’s what was decided. Michael’s at Shoreline: Pearl Jam. It includes 3 Pearl Vodkas and, if at all possible, it should be made by Lenny, since he invented it. Paul Martins: Champagne Lemonade. Champagne infused in house with local Meyer lemons and basil. Pacific Catch: Spicy Pacific. Vodka, lime, passion fruit and Serrano pepper. Cascal: Their house-made Sangria has a cult following, but you also need to order their Pisco Sour, the national drink of Peru. I had one because the bartender described it so beautifully. It might be my second favorite drink ever! First place still belongs to the Holy Smokes at Eureka. Tea Era: Roasted Barley Milk Tea. Peet’s Coffee: Black Tie. It’s sweetened condensed milk, cold brewed iced coffee, chicory infused simple syrup, and a float of half & half. Verde Tea, either location: Taro Milk Tea, #114 on the menu. It’s a favorite with the weekend crowd. Scratch: Firefly: Casa Noble Blanco Tequila, lime, lavender syrup, and fresh blackberries. Steins Beer Garden: Weihenstephaner Hefeweizen. It's a German Wheat Beer from the oldest operating brewery in the world. Ristorante Don Giovanni: Ruffino Chiante Ducale. Tapioca Express: Avocado Snow Milk Pearl Tea. Fiesta Del Mar Too: Casadores Agave Margarita, I was told this from from a very reliable source. Dana Street Roasting: House made Chai, with fresh ginger and local honey. Order early in the day… it sells out often. La Fontaine: Basil Lemon Drop. Panotiq: Cold Brewed coffee. They swear it’s amazing. They aren't listed in any specific order, but all of them are worth the time and effort. When I look back over this list, I feel so grateful to live in such an amazingly diverse and interesting community. Food and drinks from every corner of the world and spectacular weather all year round. I love Mountain View. Have you heard about Paint Nite? I kept seeing posts on Facebook about large painting events at local restaurants, so I checked one out. Okay, two of them. I went to one in Sunnyvale a month ago, and another one here in Mountain View last week. It was at Agave Restaurant on Castro Street. Paint Nite is a popular, trendy evening activity and I had a great time. Think of it as an art class that encourages consuming lots of alcohol. If you go to the Paint Nite website, you get to see the upcoming paintings and you can decide whether or not you like what you’ll be going home with. I didn’t know ahead of time what we were painting and it didn’t matter to me. I was going with a group of friends. I think the activity itself is more fun than the actual painting that you take away, unless you happen to be an artist. If you're a trained artist, or maybe if you don’t drink too much and you really listen to the instructor, you might be willing to hang your painting in your home. Buy your tickets online and plan ahead. It’s not something you can do it at the last minute. No. It always sells out, at least in Mountain View it does. There’s an instructor who guides everyone through the steps involved in the painting. Our teacher was Troy. He was creative and helpful as he walked around the room and offered advice to those that had questions, or if he noticed that you needed help with something specific. Everyone is painting the same thing and it’s fascinating to see how different all the artwork is at the end. Some people try really hard to follow what the instructor says and others totally do their own thing. We were all painting an image of a (see the photo of my completed painting) dancer with feathers. One guy showed me his and it was of a man in tight red pants and he told me it was a self-portrait. See what I mean, you can do anything you want. There’s a completed painting in front of the room for you to see and the instructor is painting one at the same time as the class, so you can watch each step. It’s not difficult or intimidating. It’s fun! I liked how much everyone helped each other, not really with techniques or painting tips, but with kind words and encouragement. It was really a friendly room full of people and would be a perfect date night activity. The crowd was all different ages and slightly more women than men. The room held about 50 people and it was totally packed. The restaurant servers come in and take your order while you’re painting, but there isn’t very much room on the table so don’t order something large. I think a drink and maybe a small appetizer would be perfect. My group met in the bar about an hour before the class started and ate so we didn’t order food once we started painting. It was a fun activity and would be great to do with a group of friends. Purchase your tickets in advance and try looking online for coupon code. Our instructor asked us to use the code “TROY20” in the future. Yes, I would be willing to go to Paint Nite again. I love Mountain View. A La Carte & Art Festival is April 30 and May 1, 2016. This year is the 20th anniversary of the festival. There will be over 200 artists. These artists have been carefully selected by an organization called Pacific Fine Arts Festivals and they are superb at bringing in some of the most talented, creative people, from all over the county, everything from fine art, paintings, photography, sculpture, ceramics, and jewelry to handmade clothing, leather goods, artisan specialty foods, wooden toys, furniture and garden art. There will be some of the Bay Area’s favorite food vendors and lots of wine, beer and iced tea and water. Here’s a link for more information on the beverages that will be served. The food vendors are hand picked from many that apply. You should definitely try the tamales, the crepes, and buy a big bag of kettle corn to take home. I got a sneak peek at this year’s wine glass and I love it. Wine and beer glasses will be available to purchase, and are quite popular with lots of the locals who collect them. Music! Yes! Live music is on stage during the entire festival and there will be street performers stationed throughout the festival. The music is the main reason some people come to festival, year after year. It’s so nice to see a big crowd of people dancing, and having the time of their life, in the middle of the street in downtown Mountain View. Fire and Police departments are at the festival and have vehicles for kids to sit in and have a photos taken. They're always at every big community event and residents can ask questions and get to know them. This festival also has a classic car show and a farmers market area. It’s nice to talk to the owners of the cars. You can see the pride on their faces as they tell you about the restoration process of their favorite high school car. The kid’s area is near the car show. Be sure to check out the giant balls (with kids inside them) in a pool of water. A few pointers to make your time at the festival even more enjoyable: wear sunscreen and a hat, if you can take the train, or public transportation, that would be great. If not, consider walking, or riding your bike. Look at this map and see exactly what streets will be blocked off. Arrive early. Wear something comfortable because it's going to be HOT this year. Mountain View loves pets, but please leave them at home. It's too crowded for pets at the festival. Bring cash for food and drinks. The artists accept credit cards, but food vendors don't. If you can avoid bring your stroller, that would be good. In some places, the festival get's really busy and a baby in a backpack would be much easier to move through the festival than a stroller. Don’t be shy about drinking a glass of wine at 10 in the morning. The festival is 10 am to 6 pm, Saturday April 30 and Sunday, May 1st. And the day after the festival, the whole street is completely spotless and you would never know that there was a festival the day before. Our city does a fabulous job putting on a big party, and then cleaning it all up, and getting back to business as usual. I love Mountain View. Have you checked out the events calendar at East West Bookshop lately? If you’re new to the area, I recommend it. East West Bookshop is one of those special places that makes Mountain View so unique. I have some friends that regularly attend drum circle events in the area and they invited me to go to one at East West with them. They have their own drums, as do lots of the other people that go, but there are just as many people, like me, who show up empty-handed and use a loaner drum. If you haven’t attended a drum circle in the last 20 years, you need to go to one. It’s probably pretty different from what you might be thinking. All different ages were in the group of 65 or 70 people, even a few kids. The leader of the circle, David DiLullo, is charming and energetic and easily gets everyone laughing. There are a few friends of his that sit beside him and they help him demonstrate what he wants everyone to do. You know… a little drum demo by the pros, then everyone does it together. David gives the group a little bit of the history of drumming, “the oldest sacred rhythm in the world” and mentioned that by being part of the dum circle, our brains were forming new connections. It’s good for you and puts the listener in a meditative state of mind. He makes the event feel very supportive and friendly and tells you that the person next to you isn’t judging you or even listening to you, so relax and enjoy the drumming. I liked that he said to visualize your tensions falling away, visualize the color of your essence and trust the chair that you’re sitting on. I had complete trust in my chair. One of the women that I went with has been drumming for years and she never tells her family where she’s going. On Saturday she was at one of her kid’s houses. When it was time for her to leave for drum circle in Mountain View, she had to say why she needed to get going and they finally discovered what their Mom has been up to! One even said “Now we know what to get you for Christmas, a drum” and she informed them that she already has one. You just never know those secret drummers are. I’ve been to many events at East West Bookshop over the years and to a few of their special events, Deepak Chopra and Dr. Andrew Weil. I love having this store in the middle of our community; they’re part of what makes our city so unique. Here’s a link to their events calendar. Check out an upcoming lecture or workshop on a subject that you’re unfamiliar with and be sure to keep shopping local. I love Mountain View. Would you like to go downtown and not have to worry about where to park, and whether or not you’ll get a ticket if you stay too long? Or go to the movies and not have to deal with finding a parking spot? I just tried the free Mountain View Community Shuttle and it was amazing. I normally drive everyplace and I think I might be willing to make this shuttle a habit. I rode the entire route yesterday. There are 2 different routes; it’s actually one big circle and you can go in either direction, so if you stay on one bus, you’ll see everything. It took exactly an hour to ride the entire route. It was very peaceful and quiet because the bus is 100% electric. That also means it’s very clean, inside and outside. It was provided to our city by Google. It also has free wifi. It was on time, at every stop. The driver was very friendly and didn’t mind at all that we were tourists. She asked us if we planned on getting off and we said “no” and that we’re just enjoying the free ride that Google provided. Yes, it was like we were getting a little tour of the community. I would definitely recommend it to people who want a free tour of our city. The other riders looked like they were going to doctor appointments, out to lunch or shopping, but not jobs. This particular shuttle is probably more popular with people doing community things as opposed to going to work for several reasons. It starts at 10:00 am, which is pretty late for going to a job and because it doesn’t go to the tech companies. And there are other shuttles that are more focused on taking people to work, but this one is for running errands like going to the Teen Center, Senior Center, Target, lunch downtown, or an afternoon movie. Ask the driver for a schedule or print it out ahead of time. Thank you to Google for providing our city with this free shuttle service. I love Mountain View. here are 50 things you need to experience in Mountain View! Go out to dinner in downtownMountain View, where there are over 100 restaurants. Journey back in time with a visit to the Rengstorff House. Take a leisurely stroll on the Stevens Creek Trail. Go on a picnic in Cuesta Park, Pioneer Park, Charleston Park, or Eagle Park. Hang out at an authentic Silicon Valley dive bar: Bert’s Alibi, Fred’s Place or Mervyn’s. Take Salsa lessons at Albertos. Learn about and visit our endangered Burrowing Owls. Go golfing at Shoreline Golf Links. Go windsurfing, kayaking, or stand-up paddling at Shoreline Aquatic Center. Enjoy a visit to our 2 community gardens. Go to a performance at The Mountain View Center for the Performing Arts. See the Shockley Labs sign and honor the true birthplace of Silicon Valley. Attend the Mountain View Art & Wine Festival. Take your photo in front of local tech company signs like LinkedIn, Google, Microsoft, Youtube, Intuit, Quixey, What’sApp. Take your photo with the Google Android sculptures. Shop at the award winning Mountain View Farmers Market. Ride a bike around town with the Bay Area Bike Share program. 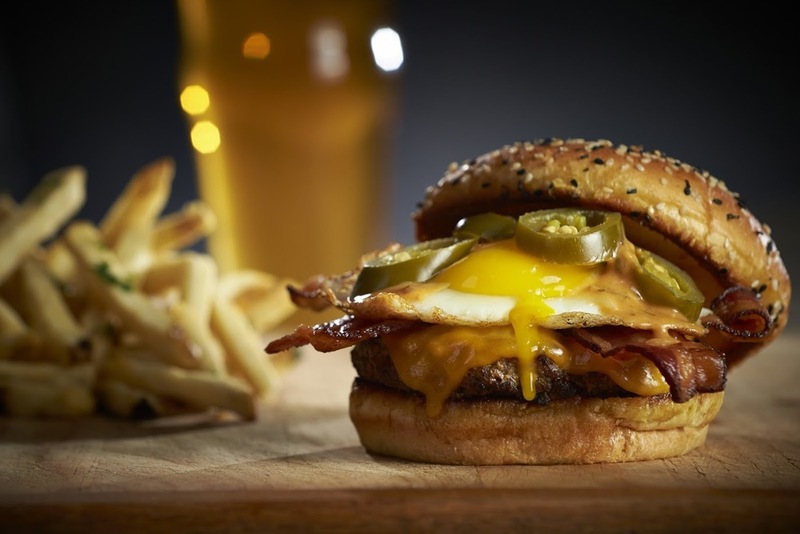 Slurp beer and watch the game at Tied House, the south bay’s original microbrewery. Visit Moffett Field Historic Society Museum. Go to a concert at Shoreline Amphitheatre. Eat macarons from Alexander’s Patisserie. Live it up and eat like a king at Chez TJ. Fly a kite at the official kite flying area of the city. Go on a Wine Walk with your friends. Enjoy the annual Obon Festival. Learn about Silicon Valley and geek out at theComputer History Museum. Definitely plan on attending the A La Carte & Art Festival. Dance in the street during Thursday Night Live. Sign up for a Coffee Tasting Class at Red Rock Coffee. Get to know yourself by attending some of the special events at East West Books. Take a yoga class at Yoga Belly, Yoga is Youthfulness, or California Yoga Center. Go to a play at Pear Theatre. Use CalTrain or VTA Light Rail to get around the bay area. Check out the new plush, oversized, electric loungers at Cinemark 16 Theatre. Mark your calendar and plan on attending Oktoberfest. Glimpse California’s architectural past as you look at the Historic Adobe Building. Get your kids involved with Peninsula Youth Theatre. Visit the charming little Jehning Family Lock Museum. Enjoy the well known bookstores downtown: East West, BookBuyers & Books Inc. Learn about space exploration and all things NASA at the Ames Research Visitors Center. Swim laps at Eagle Park Pool or Rengstorff Park Pool. Enjoy shopping downtown at interesting boutiques and stores, like Boutique 4. Enjoy the nightlife on Castro Street at Opal, Stephens Green, and Molly Magees. Grab your lawn chair and watch free movies in the park during the summer. Go bird watching in the bay. Visit the Mountain View Public Library events page for a wide variety of activities. Attend the Technology Showcase for the latest tech gadgets being made in Mountain View. Bring your friends to the Silicon Valley Irish Fleadh and plan on ubering home. After writing this list, I can’t believe how proud I am to say that I live in Mountain View and I absolutely love our community! I stopped by Chemila Collection last week and met the owner, Chemila. The store open in late 2015 and it is located at 143 Castro Street, next door to Olympus Cafe and Bakery. It’s a women’s contemporary boutique that carries a fashionable collection of clothes that have a fun, creative twist on tradition. Everything is based on Chemila's travels to France, Italy, Nepal and India. The current collection is mostly neutral tones with a splash of color. Chemila likes that there isn’t a specific dress code for women in Silicon Valley and that her customers are just looking for something hip and professional, something like a little black dress, but one that is just as comfortable with heels as it is with sneakers. She has them and she showed me! The store also has a nice selection of accessories. There is a wide variety of scarves and pashminas, in everything from silk, cashmere, cotton, and blends. She showed me the difference in weight between a night time wrap and a daytime scarf. They’re all very nice and I could imagine someone getting off the train and wanting to stop by a grab a new scarf on their way to a downtown meeting. We’ve all been there… if only you had thrown on a scarf before you ran out the door. Some of the jewelry in the boutique is handmade by Chemila and the women in her family and special items or combinations of stones can be requested. Chemila has worked in retail for years and always dreamed of having her own boutique. She’s worked for both large and small companies and thought to herself what she would do differently if she had her own store. She’s a start up, right here in the middle of a sea of tech startups, where every other person is wearing a hoodie and jeans. She’s very in tune with Silicon Valley fashion and has all kinds of suggestions for women who are done with the traditional blazer or pantsuit. I love Mountain View. Rocket Fizz finally opened and Mountain View is thrilled to have more exciting retail downtown. It is a soda and candy store. Now… those words don’t even begin to do the store justice. Mark McLaughlin moved to Mountain View to open the store and he loves our thriving, diverse community. Rocket Fizz is full of retro candies that we remember from our childhood and hard-to-find soda from small bottlers all over the country. If you have something obscure in mind that you would like to see, no matter what country you grew-up in, stop by and introduce yourself to Mark. I’m pretty sure he could help you out. For example, he carries Cheerwine from North Carolina, Faygo and Rock-n-Rye from Michigan, Fitz’s from Missouri, and Ale-8-One from Kentucky, just to name a few of the American sodas. While I was talking with Mark, a customer came in who is a big fan of cream soda and he is in the process of tasting each of the cream sodas that Rocket Fizz carries. Apparently, it’s a very serious hobby and similar to wine tasting. There are quite a few dedicated cream soda (creme soda) fans, as well as ginger beer (ginger ale) fans in the area. This particular customer told me how pleased he is that Rocket Fizz is just around the corner his start up and that he visits the store almost daily. Rocket Fizz also carries their own brand of sodas. Those are the really crazy ones that you want to give as gag gifts. The dictator series includes Qaddafi’s Cream My People, Fidel Castro’s Havana Banana and Kim Jong’s Orange Nuclear Bomb. 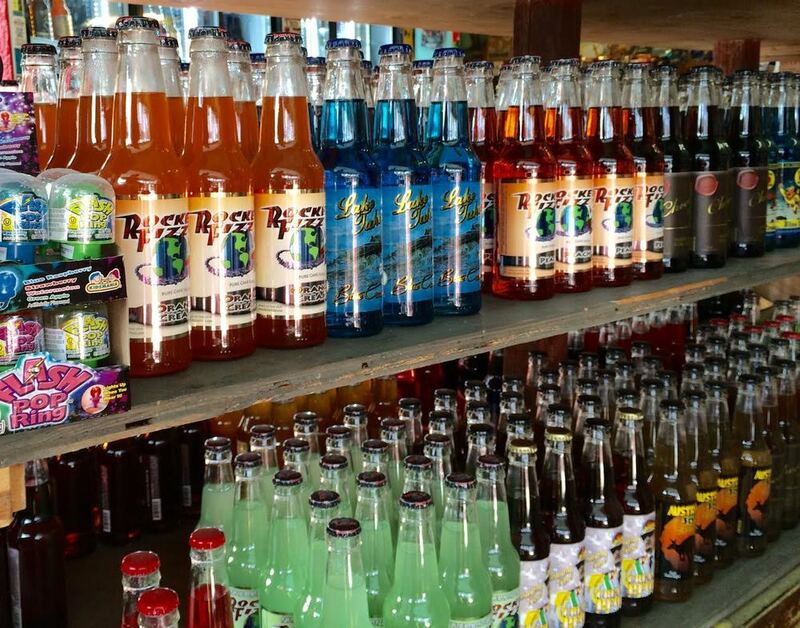 Some of the other ridiculous soda flavors made by Rocket Fizz include Sweet Corn, Peanut Butter, S’mores, Marshmallow, Cotton Candy, Bacon and many others. The store is at 298 Castro Street and has over 100 flavors of salt water taffy. You’ll see lots of candies that you had completely forgotten about and a flood of childhood memories will hit you, hopefully pleasant. Some of the vintage candies include Charleston Chew’s, Marathon Bar, Crows, Dots, Turkish Taffy, and Abba Zaba. Have you heard of Bean Boozled? 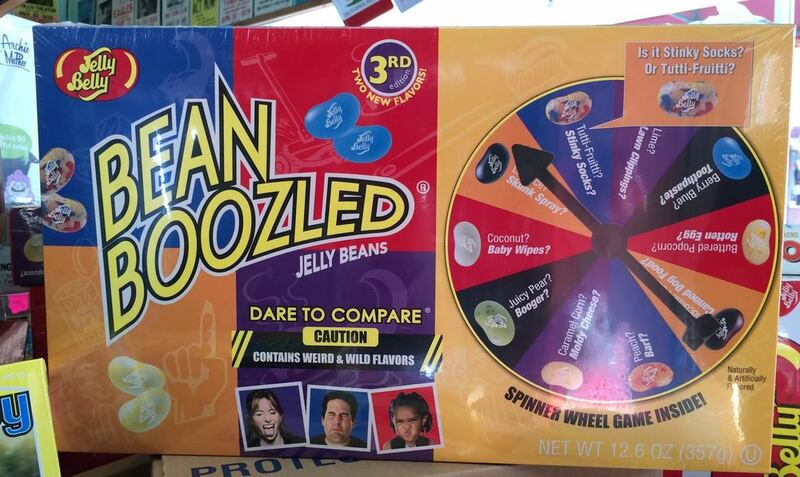 It's a game where each person has to determine the flavor of Jelly Belly they've just sampled... Would you know the difference between juicy pear and boogers, or coconut and baby wipes? I know, it's totally gross, I'm just sharing the facts with you. I hadn't heard of it before, but now I'm caught up on it. (Thanks Mark) Rocket Fizz sells the game and the refills for it. Rocket Fizz has a ton of retro toys, like the kind you used to see advertised on the back of comic books, nostalgic, but with a modern twist. Pranks, magic tricks, and silly things that everyone will enjoy at the next office party. If you need to get a White Elephant/Secret Santa gift, this is definitely the place to go. I really enjoyed hearing Mark say that he moved to Mountain View just to open this store and that he loves our community. When you shop at a store that is owned by someone in your community, 68 cents out of every dollar that you spend there stays in the community. Shop local and keep your money in our community and support local retail. We don’t have very many stores (compared to restaurants) in the downtown area and we should embrace them and let them know how much we love them! And how much we love Mountain View. Poké is big news. It’s the trendiest, healthiest new food item to hit the Bay Area. I met Chris Lim, founder of Poké Bar, this week. Poké Bar is inside the front door of Ava’s Downtown Market on Castro Street in Mountain View. Poké is a traditional raw fish salad served in Hawaii. It’s an appetizer of chopped fresh fish, mixed with asian spices, herbs and seaweed. Until recently, it was difficult to find poke in the Bay Area. Yes, it was pretty easy to find in southern California, but it hadn’t really found it’s way to the bay. That’s changed now. Chris (and his 2 partners) have 4 Poké Bar restaurants in Los Angeles and another 2 are in the process of opening in San Francisco. One of them will be in the Twitter building. The Mountain View restaurant attracts lots of tech workers in the downtown area. Most of them grab it to go and head back to their office, but there are tables inside Ava’s Downtown M arket, as well as outside along the sidewalk. They do a booming business at lunch and almost as big of a dinner crowd. It’s possible that you’ll have to stand in line for a few minutes, but once you get your turn at the window, his friendly staff makes your meal right in front of you in about 3 minutes. They made suggestions to me about what to add to mine, since I wasn’t familiar with all the ingredients. I had traditional white rice, although most people get brown. I got both fresh tuna and salmon, a combo of the house dressing and ponzo dressing, some spicy mayo sauce, plenty of ogo (Hawaiian seaweed), fresh veggies and chunks of mango and a bowl of miso soup. It was fast, delicious and healthy. I’ll definitely be back for more. Chris told me that about half of his customers have had poke before, either while on vacation in Hawaii, or in Los Angeles, and the other half are unfamiliar with it but have heard good things from their colleagues. He also said that he’s had lots of repeat business and once one person in the office discovers Poké Bar, the entire office ends up coming the next day. He feels grateful that our community loves his food so much and he’s off to a very successful start. The tuna is all wild caught and the salmon is either from Norway or Canada, depending on what is freshest. He has 4 different fish vendors and buys in small quantities to guarantee that his customers get the freshest possible fish. His staff prepares each item in very small quantities so the quality is the best possible. 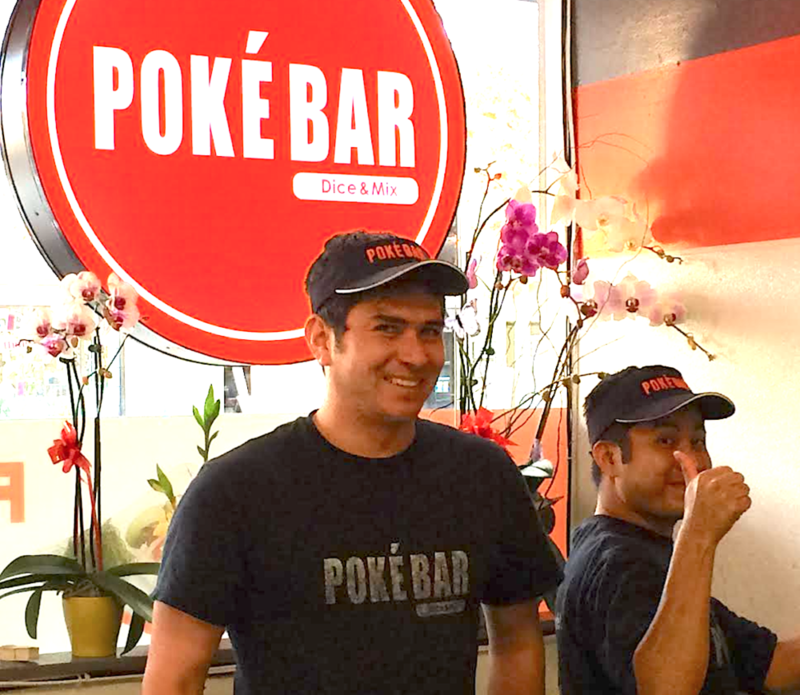 As you peruse Castro Street looking for your next exciting lunch destination, stop by Poké Bar. I guarantee that it’s going to be a regular favorite. And Ava’s Downtown Market is a great local, family owned market. It’s so convenient to grab some groceries downtown and you get your lunch at the same time. I love downtown Mountain View.